Josh Turner’s an excellent singer. Is it a future classic? Of course not. Heck, it’s not even a Summer ’10 essential track. But it’s an enjoyable listen, something it likely wouldn’t have been if co-writer Rhett Akins was still given access to a studio mic. I appreciate you guys bringing back the Single reviews, even if it was just for a day today. I came to this blog because of the single reviews, and they’ve been really lacking since probably the beginning of the year. Thanks for bringing it back and hopefully it stays for a little while longer. I can’t deny that “All Over Me” is fun, but when I hear lines like “Bring on the sunshine, bring on the good times,” I think “Surely you can do better than that. 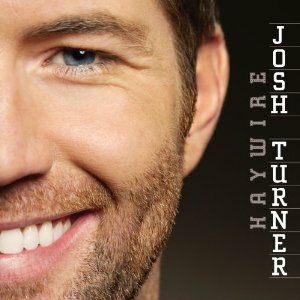 Furthermore, I have a high respect for Josh Turner, and I tend to hold him to a higher standard than some other artists. I wouldn’t be surprised to hear a song like this from Kenny Chesney, but hearing it from a great artist like Josh Turner, I thought it was a disappointment. Josh’s past hits like “Would You Go With Me” and his previous smash “Why Don’t We Just Dance” show him to be capable of far better. The lyrics aren’t spectacular but what I love is the production! I mean who else but Turner could pull off a song with a killer piano intro like the one on this song?! …beer and (string-)bikinis are back in country music – it’s about time. I am glued to a computer working 8 hours a day. The radio is the only thing that keeps me sane some days. I have not listened to country music in a long time because some of it just got so ridiculous that I changed the channel. For a change this week, I changed the channel again and heard Josh Turner singing, “If I Didn’t Feel Like This.” Now every time that song comes on, I stop working and just sit there and listen. It has been a long time since a song touched me like that. As some of the great artists describe it, “You have got to have your heart and soul in a song.” That he does. I¡¦ll right away grab your rss feed as I can’t find your email subscription hyperlink or newsletter service. Do you have any? Please permit me know so that I may subscribe. Thanks.